Simple question – where to sell? sell their images at a very low rate (anywhere from $.20 – $10) for a royalty-free image. A number of microstock sites also sell vector art, and some sell Flash animations and video, as well as images. OK and what is royalty-free? Check the Wikipedia again. Royalty-free (RF) – „Free“ in this context means „free of royalties (paying each time you use an image)“. It does not mean the image is free to use without purchasing a license or that the image is in the public domain. You pay a one-time fee to use the image multiple times for multiple purposes (with limits). No time limit on when the buyer can use an image. No one can have exclusive rights to a Royalty-free image (the photographer can sell the image as many times as he wants). 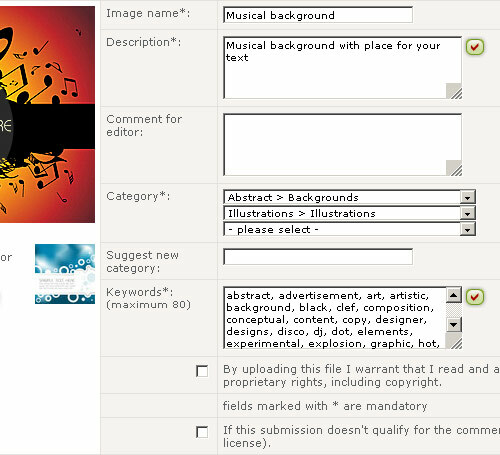 A Royalty-free image usually has a limit to how many times the buyer can reproduce it. For example, a license might allow the buyer to print 500,000 brochures with the purchased image. Simply said a royalty-free licence means that the buyer can use it several times, for various projects, but without exclusivity (other buyers can use it at the same time). The seller (author) can sell it on various sites (it is standard practice that photographers and illustrators sell their images on more – not only microstock – sites). As you can see, the price of your graphic work on microstock will be just a few dollars (sometimes even less! ), but on the other hand, you will make many more sales on microstock in one day than in five years on a classical stock site. First of all you need to register yourself on some microstock site (it is free of charge). Part of the registration process (in most cases) is to upload a copy of your ID – it is a standard procedure for identification. On which sites can you register yourself? Check the list of best microstock agencies and also at the end of the article you will find some recommendations of which sites are the best for beginners. After your registration, the agency needs to review your work – you have to send them your best sample images (3–10) and they will decide if you are good enough for them. If so, you can start uploading your files. If not, you have to work on yourself, select some better images and try again (or try again on some other agency). Some agencies don’t use this step – it means, that you can start uploading your photos and illustrations immediately ( Dreamstime, Fotolia, BigStockPhoto, 123RF or Crestock). Others are quite hard – check some articles with acceptance tips and tricks. Nearly every microstock site offers an FTP access, so you can upload your files quite easily (most of them has also upload via HTTP right on the web page). Important note: The photo must be yours! Also if you are creating some illustration, you have to use your own sources, you can use part of the graphic work from the internet and just add some sauce around. When your file is uploaded, you have to add some information to it – name, description, keywords, categories. This is very important part of uploading – the name and keywords has the power to bring the buyers to your pictures. The more accurate keywords you use, the better (try to use more keywords than only 5–10). Now the reviewers from the microstock agency will look at your image(s) and approve or reject them (you will get an email about it). If your image is rejected, you can (sometimes) fix the problems and upload it again – it depends on the rejection reason, sometimes it is just in the description, keywords, sometimes you have two colour profiles in the vector illustrations, noise in the photo, and sometimes you simply can’t fix it (poor quality, bad lightning,…). It can take from 1 hour to 1 or 2 days after the acceptance of your image for it to be visible on the stock site / image search results. So the first sale can be within one hour (on some sites), but mostly within a few days – it depends on the quality of the picture, size and quality of your portfolio and also on the specific site. If you have 10 images in your portfolio you have to wait quite a long time for the first download, if you have around 1000 images, then you can have a sale every 5 minutes. Sometimes people ask me – how much have I pay to get my photos / illustrations into microstock sites? Everything is for free on every microstock site – the agencies will get some percentage from your sales (agencies take around 50% – 70% of your earnings). So the final earnings for the author are around 25 cents to 30 dollars, mostly around 1 dollar. You need to have minimum payout amount to transfer your money from the microstock agency to you – on some sites it is around $30, but mostly it is $50, $75 or $100. If you have bigger portfolio, then you will reach this minimum amount quite soon, but if you are just a beginner with a few images, then it can take you a few months to get your first salary. Which sites are the best microstock sites for beginners? My recommendation is to start on Dreamstime – the registration is easy and you don’t need to send them sample files for review – everybody is accepted. So you can start uploading your images immediately! Of course, that some of your photos or illustrations will be refused for various reasons, there’s a standard selection process, which will show you which images are good for microstock (once again microstock don’t need any art production, they want commercial shots and illustrations). You shouldn’t be frustrated from the small amount of sales – you have to build a bigger portfolio to earn bigger money. With 10–30 images on Dreamstime, you will have 1–5 sales within one month (this is just a rough estimate, it depends on quality of your images). The more images, the more sales. After some time, when you get some basic microstock experience, you should try Shutterstock – it is the best (at least for me) agency, which generates the highest income for me. But it is quite hard to get there (check some tips). For more info about other agencies, check the list of best microstock agencies. Microstock agencies need new customers and also content submitters – so they offer affiliate programs. And as you can see all links on my pages have some referral code. If you use them for your registration, I will get a few dollars from those agencies (but only if, you buy or sell something). It is not much – you can’t get rich from it, but it is at least some motivation for my writing and for helping you to be successful on microstock (if you have any problem, just leave a comment and I will try to help you). So please use those links, thanks. i am interested in submitting some samples of my artworks, however they are all rendered in traditional form, can i still submit them to your site. What do you mean by „traditional form“? You have it on the paper? Those agencies needs the photos and illustrations in digital format, so you have to scan it or make a digital copy of it using some other technology (and then clean it a bit). How many images do you have on these sites and what is your average revenue per month? Well on the Shuterstock I have nearly 1800 images, on Dreamstime 1400 (this are the best ones, revenue on others is much smaller) and the monthly revenue is together between 2000 – 2500 dollars (depends on how much new images I’m adding within the month). Are those 1800 images mostly photos? And how long did it take you to accumulate that many? my portfolio contains mostly vector illustrations, but at the beginning I was selling just photos. Now I prefer illustrations, because they have bigger selling potential and it is easier for me to create them. Wow! First, Thank you for the quick response. Second, is that $2,000-$2,500 fairly consistent and how quickly can you get that many images accepted onto those sites? Is there a limit that would say prevent me from uploading 2,000+ images over say a 3–6 month period. Consistent? Depends if you are consistent with your uploads :) And of course, that some months are stronger than others (the best are spring and autumn – check my microstock earnings reports). Limit? 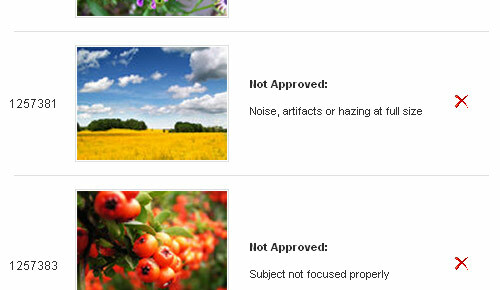 On some sites like iStockPhoto (15 images / week) yes, but on others (Shutterstock, Fotolia) not. On some the limit depends on you approval ratio (Dreamstime) and on others is the limit quite big (Stockxpert – 50 img/day). But remember the earnings depends more on the quality of the immages than on the amount. You preach being consistent with your uploads. Is this because the sites take your images down after a certain amount of time, or because your images only tend to sell a certain amount of times? Or is there something completely different I’m missing? Sorry for all the questions,this just seems like a viable way for me to save up the money to break free from my day job and into freelancing. Hi, the reason why you should upload regularly is that the buyers wants new fresh images – and they can sort images, so the newest are at the top. New images brings the buyers to your portfolio – if the buyer saw some of your new images, he wants to see more and will visit your portfolio and will buy more your images. If you don’t upload something new, your portfolio will lost the buyers attention. This works very well on Shutterstock – with every batch of new images the sales are going up, but after few days it starts to go down, so you have to upload new batch. On some other sites (iStockPhoto, Dreamstime, Stockxpert) the fall is not so obvious. Hi, what software do you use for creating vector illustrations? And what is the OS and PC? Im using Adobe Illustrator on Windows XP running on standard computer (some 3 GHz Intel Pentium, 2 GB RAM). I am new to the microstock business and less than a month ago have started with 123RF and Dreamstime. I work as an Illustrator and have uploaded 16 pictures on both sites. No sales from 123RF but 3 sales from Dreamstime. I will soon try with shutterstock. Although it’s encouraging to see some sales, it’s discouraging to see how much content you have to upload (1800 in your case) in order to make a decent income. If I spend 2 or 3 hours minimum on each illustration (and believe me that’s my minimum) I would have to spend around 6000 hours to get that kind of content (600 days non-stop working 10 hours a day)… not including the time that you spend on keywords, uploading and so on… My point is: Is it worthy ? (I guess that I am the one who has to answer that). I would probably sell more by doing portraits on the streets. So right now I just do it on my spare time. Thanks from Greece, and keep-up the good work! If you spent 2–3 hours on each illustration, then I’m not sure, that microstock is for you :) Maybe try to sell it on iStockPhoto, they pay more for better illustrations, or try some midstock, or sites, where you can select the price of your work. The microstock is more for „easy illustrations“, on which you don’t spend so much time (once you have some portfolio, you can easily combine your artworks). And answer for the second question – you have 2 choices – submit it with model release, or submit it as an editorial image (in such case, you don’t need the model release, but the rights for this illustration will be a bit different). I was wondering is that if you sell your photos on a microstock site. Do you still retain the copyrights on ownership of the images? Also if the images are sold for temporary use or limited print run how do you know the buyer is not using them beyond the life of the contract? And can you be selling the same images on multiple sites as well as in other domains such as retail outlets or for displays? Yes, you still have copyrights on ownership of the images – there is only one exception – Dreamstime, where you can (if you want) sell the rights for much higher price – 350 and more dollars / image. Check what Royalty-free licence means on the Wikipedia: Royalty-free and also the other option: Rights Managed. In Royalty-Free is not temporary use and the print limits are quite big. But there are still some limitations. And how do you know if the buyer is not using them beyond the contract? Quite hard – but this is same as with other licences and other goods that you are selling on the internet. When you are selling your images with the Royalty-free licence, you can sell them also on other sites. There is no problem with it (and it is standard, that microstock photographers are selling on several sites). But your photos (or you as a photographer) can’t be selling on one site as an exclusive. I hope, that my answers will help you. I have a license question. If I sell reproduction right for some$ for a year, can I sell the same image prints by myself? How many people I can sell reproduction right for the same illustration? It should be a exclusive? If you are selling your images via microstock sites, you still can sell or reproduce it as you wish on your own site, or at any other place. The only problem can be with exclusivity – you shouldn’t sell it anywhere with exclusivity. Awesome post. Will think about the tips!I do some photography as a hobby. I can get some great shots (especially of my dog), but as an amateur, I realize that consistency is very important. Istock and bigstock, and recently discovered depositphotos I usually sell the most. The great thing is that is not difficult to make some money if you’re willing to spend some time shooting some images. What is the minimum resolution (if there is any) for vector illustrations? there is no minimum resolutions for vectors – vectors are resizable without any quality losts. Thank you for so many great tips in here. I have decided to sell my illustrations on microstock too. But I’m facing a huge problem, as I cannot save them in small EPS format, they exceed 15MB actually they far more than that. My illustration contain mesh, gradients and I’m grouping a lot, not sure what causing the prob. Can you please help me explaining what are the right steps to do in order to achieve a small EPS format? Ah and I already deleted all the swatches, symbols etc. Thank you in advance:) Keep rocking! PS Thanks for making this site! the main sites will not accept vectors in SVG, maybe some smaller one can. If you want to sell your work on microstock, you will need Adobe Illustrator (or you can try Corel Draw) and export in EPS. I hope, that it will help you. I was wondering if you think it is worth it to do this? I really like your site, but it is too sad that you stop updating it..
1.Most of my illustrations on Dreamstime,big­stock,gl,123rf are in JPG format, because sometime i’m too lazy to upload EPS files . If all my new illustrations uploads will be in vector format for all ,even the smallest microstocks , will it boost up my earnings? 2.Finaly I want to try shutterstock, because my portfolio on each smaller microstock sites about 500 artworks. My friend claims that his earnings goes down this year on shutterstock. Sorry for this question, but can you tell how much average downloads monthly you have on shutterstock with your huge portfolio, and what is your average earnings on that site. As far as I know, nobody register his images for copyright protection. I looked at the site – there is a link to http://www.co­pyright.gov for more info. And the registering costs around 35$ – that’s too much for a microstock photo/illustration. And I don’t think, that it has some sense. I didn’t stop updating this site, and will not do it! Even more, from October, I will have more time and will update more often. I promise! My average earnings on Shutterstock is thousand of dollars (I don’t want to be more specific). Thank you for taking the time to share these amazing information! I’m a new ILLUSTRATION ONLY mikrostocker and I wanted to ask your about the importance of uploading regularly. What if you don’t what does regularly means? Does it have to do with Microstock Sites algorithms on how often your images appear or what? Thank you again for the info you share! the regularity is most important for Shutterstock – there was a big difference if you upload regularly or not. Few months ago they changed the image search algorithm and now it is a bit less important. If you don’t make similar rule, it will be harder for you to submit on those sites… and the earnings will be smaller. First off, thank you for the information; I found very useful. My question for you is this; Generating some income from selling artwork online is income. Are their income tax requirements associated with type of income? I am new to illustration, and recently drawn some illustrations in illustrtor cc totally with the help of included shapes brushes icon etc. in the software itself. I just want to know can I sell those illustrations on microstock sites without the problem of copyright violation? Or am i supposed to draw everything at my own? Kindly explain. GraphikSell is a marketplace where graphic artists, designers and photographers can sell their own graphics, logos, layered Photoshop files, vectors, icon packs, Adobe add-ons and design templates. At GraphikSell all products are licensable for use in your sites, advertising or promotional materials to illustrate specific things, concepts or ideas.You can hear from authors, ask questions in the comment on items, and view their portfolios. I recently got into dreamstime and after some files were accepted I got the notification:Please fill the tax form in order to avoid lower royalities. The form requires me an ITIN.I am from Europe. Do I really have to get the ITIN? I saw there is a loooong way to get it. Did you also have this problem?